I finally found THE recipe that’s everything I’ve been looking for in homemade hot chocolate success. Trust me, I’ve been looking for a long time and haven’t been satisfied with anything to share with you until now. 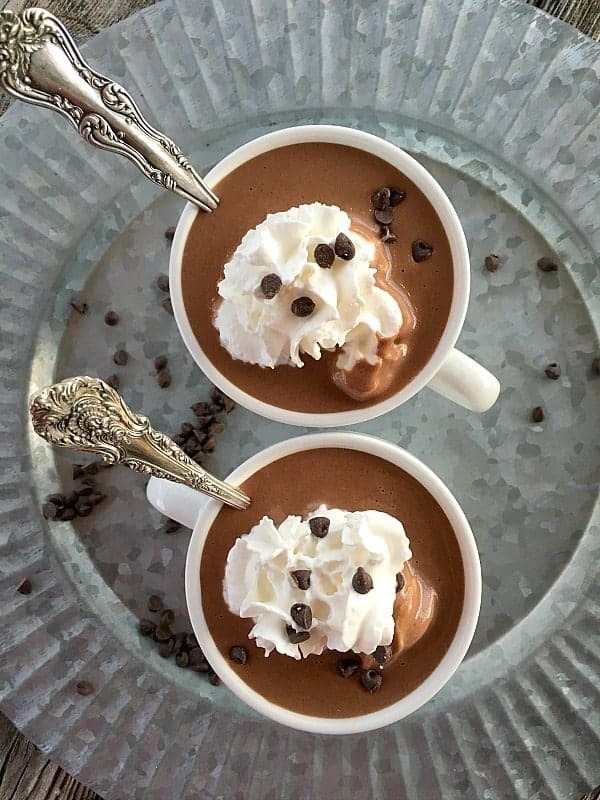 Hot Chocolate In the Slow Cooker is creamy and perfectly chocolatey, smooth and satisfying, big emphasis on the smooth part. Satisfying yet irresistible. I mean it… irresistible. And did I say chocolatey? 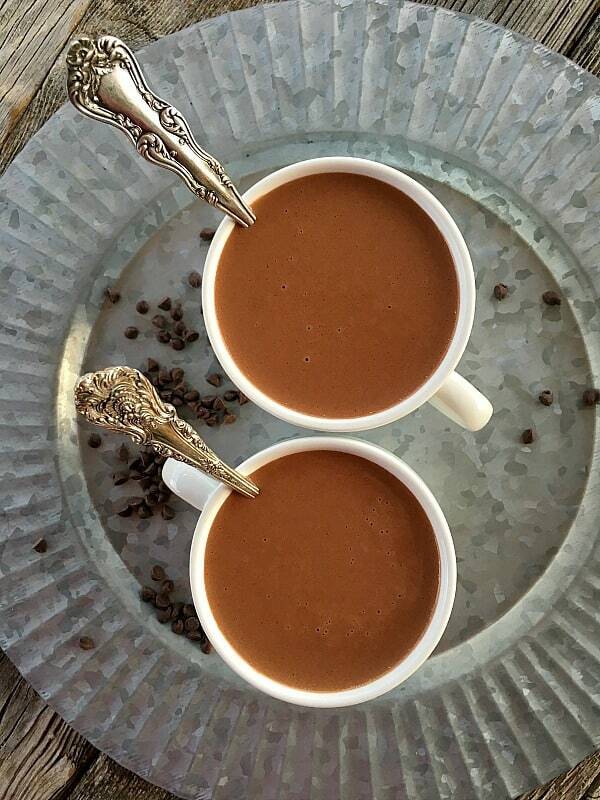 This perfect hot chocolate starts with milk and half-and-half. You can certainly use milk alone and it tastes “good”, but why not splurge a little here and use the half-and-half. You won’t be sorry. Good quality chocolate chips, semi-sweet or dark both work great, and a tiny dash of salt. That’s it! A couple hours in the Crock Pot to fully melt the chocolate, and it’s ready to serve. That’s the other beauty about this recipe, it’s almost too easy. And because it’s so simple, easily change it up with a little peppermint, or peanut butter (my favorite), or cinnamon and cayenne for a Mexican hot chocolate. This hot chocolate is quite satisfying and decadent. Perfect served in tiny espresso cups. Easily customizable for peanut butter hot chocolate, Mexican hot chocolate, hot chocolate with a touch of mint. Use a 4-quart slow cooker. Add the milk and half-and-half to the insert, and then stir in the chocolate chips, and sugar. Add a dash of salt. If making flavored hot chocolate, add the peanut butter, or spices, or mint now also. Cover and cook on Low for 4 hours or on High for about 2 hours. Stir at the half-way point to combine everything and allow to cook completely, until smooth. Stir well again at finish and lade into mugs. Top with whipped cream, if you like and additional mini chocolate chips. If you'd like a smoother texture, you can strain the finished hot chocolate through cheesecloth or a fine mesh strainer. 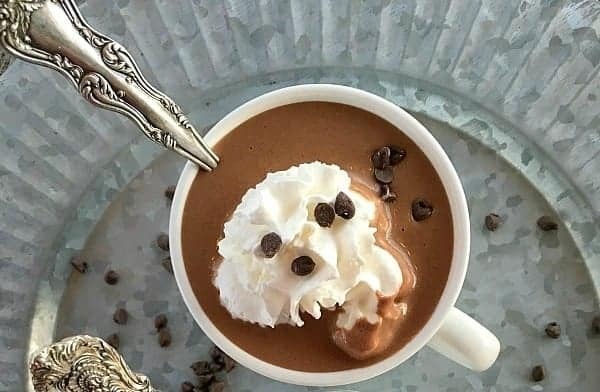 Make ahead: This hot chocolate is fabulous if made in advanced and then placed in refrigerator until needed for serving. 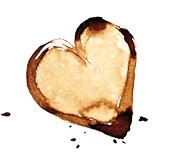 Simply heat back up and serve. 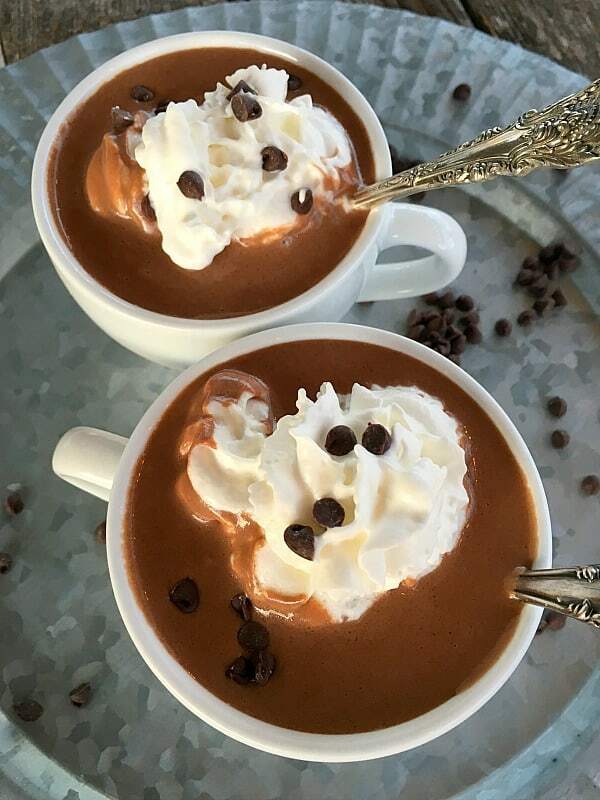 If serving this hot chocolate for a party, be sure to go over and stir it in the slow cooker once in awhile. The chocolate may settle just a little and if your slow cooker is very hot, a slight milk film may form on top. So, giving it a good stir every 30 minutes or so will resolve this issue. Recipe adapted from 5 Ingredients or Less Slow Cooker Cookbook. Delicious, chocolaty and creamy! As per usual, your recipes are amazing!! I had this bookmarked since forever and today I made a half batch to try it out as I have a tobogganing party this weekend for my kids that I’m hosting. So I was wondering if you’ve done large batches of this? I have a huge slow cooker(7 qt I think). I need to make enough for around 45 people-how much more for cooking time? And what are your thoughts on reheating time? I’m thinking of doing it the day before and reheating it while everyone toboggans-approx an hour and a bit? Any ideas would be great, thanks!! Does the plain hot chocolate still have peanut butter? Peanut butter is both listed in the main recipe and as an add in? Jill, Sorry about that error on the printable recipe. No, only add the peanut butter if wanting the peanut butter cup hot chocolate. I’ve since corrected the recipe, so thanks for catching that.